Medical Services Overseas (MSO) advises international companies on health issues in the developing world, promoting cost efficient, quality care. Health Audits provide practical, sustainable and low cost solutions to problems including emergency preparedness, occupational health, regular medical care, water quality, sanitation and insect control. Other services include health seminars and telephone counselling services for expatriates and business travellers. Medical Services Overseas helps international companies to manage health risks in resource poor countries. Central to all advice is on-site audit, covering reviews of emergency care, occupational health provision, standards of local clinics and hospitals, employment health legislation, drinking water quality, insect control, sewage disposal, staff training and opportunities for community health projects. Solutions given are simple, sustainable, evidence based and cost efficient. For managed projects we monitor health activities weekly using returns to train, support and encourage health professionals in delivering highly cost-effective clinical care while developing simple disease prevention services. Health Seminars train expatriates and business travellers in the recognition and management of health hazards in the developing world. All courses are doctor-led and hands-on. Counselling Services provide counselling by ‘phone – anywhere in the world – for employees and families working abroad, helping to keep employees at work and preventing relationship breakdowns. All counsellors are accredited and trained in the UK. Physician back up is included. Detailed medical assessments of occupational disease risks in the work place for employees with specific high risk exposures lead to the early detection of preventable ill health, improved productivity and reduced exposure to litigation and advice on health surveillance and disease control. Connelly vs. RTZ – House of Lords ruling, 1997. Medical Services Overseas can reduce liability to litigation by reviewing pre-employment and periodic screening procedures and advising Management on health risks. 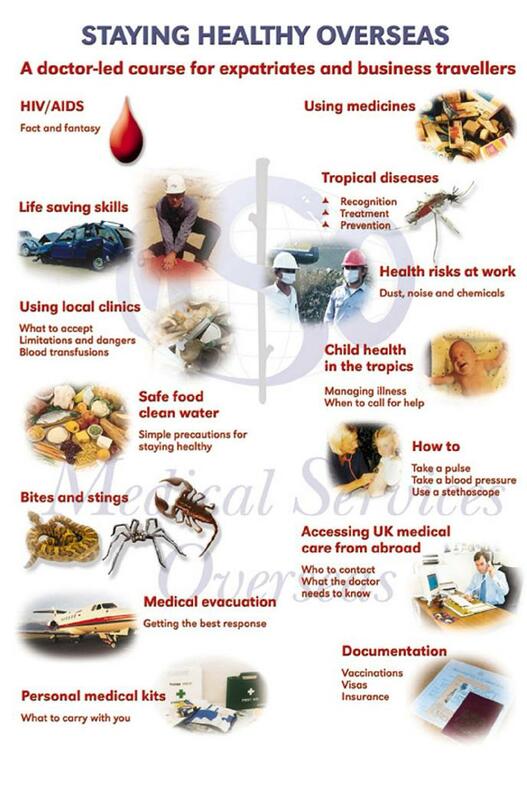 Medical Services Overseas also reviews health surveillance programmes to ensure compliance with local health and safety law country occupational health legislation. First Aid courses are tailored to companies’ specific needs and are run by an Medical Services Overseas doctor or an HSE (U.K) accredited trainer. Medical Services Overseas assesses the quality of local medical care, and forms a working relationship with local doctors and regional specialists, to ensure appropriate and cost effective health care for employees. Where standards require monitoring Medical Services Overseas introduces disease management protocols and monitors compliance by remote audit of weekly clinic returns. Medical Services Overseas can also carry out assays of important drugs where medication purity is a concern. Simple, low cost health projects with defined end-points can bring about considerable improvements in the health of local communities. Projects need to be selected and implemented by the community with planning, funding and supervision from industry. Projects with defined, cost-limited end points are generally preferred – such as the provision of safe drinking water. Staying Healthy Overseas – A doctor-led course for expatriates and business travellers. Psychological ill health is common in business travellers and expatriates and in families on long term postings. Medical Services Overseas Counselling Services provide counselling by ‘phone – anywhere in the world – for employees and families working abroad, helping to keep employees at work and preventing relationship breakdowns. Counselling helps people to help themselves – to clarify their thoughts, define their aims and achieve their solutions. It is also sensitive, personal and completely confidential. Medical Services Overseas offers one-to-one continued support and advice from qualified and highly experienced U.K Counsellors. Clients need to make only one short call to set up unlimited telephone consultations at times convenient to them. All consultations are routed from the U.K at no cost to the client and no additional cost to the company. An experienced travel physician is also available at no additional cost.